Four boats in the Volvo Ocean Race rounded Cape Horn, with Team Alvimedica leading the battered fleet past the maritime world's most infamous landmark at 1407 GMT, just 15 minutes ahead of race leader Abu Dhabi Ocean Racing. MAPFRE and Team Brunel were hot on their heels as the fleet prepared to head north at last and back in to the Atlantic for the first time since November. 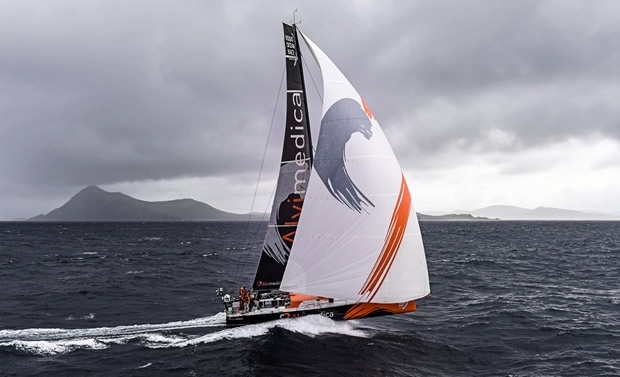 For Team Alvimedica’s Charlie Enright, rounding Cape Horn was the culmination of an eight-year dream, which took embroyonic shape while making the Disney film of the Transpac, Morning Light. Abu Dhabi Ocean Racing skipper Ian Walker, who has so far carried out his pre-race battle plan of earning podium places on every leg, was equally buoyant. “I’m just happy to get here safely. That’s the main thing. There is still a long way to go, but it’s a big relief. And it’s an even bigger relief because we’re in good shape,” he said. “Cape Horn more than lived up to its reputation. We have been sailing on the edge for the last 500. The waves are so big you can’t go around them so you have to go through them and the water down here is 5°C. It’s a relief to have got around in one piece. “We knew how important it was to get around the Horn in touch with the pack, unscathed and in a position to challenge for the leg win in the final 2,000 miles. We kept reminding ourselves – you can’t win the Volvo Ocean Race on this leg, but you can lose it. We have had plenty of hairy moments on the way from Auckland and even the odd wipeout but we have no injuries and the yacht and sails are in good shape for the final push. A Southern Ocean frontal weather system packing 25 – 30 knot winds and driving up huge waves meant a white-knuckle ride as Azzam tore across the dividing line between the Pacific and Atlantic Oceans at speeds consistently over 25 knots. The Emirati boat has just set the fastest 24 hour passage in the race, travelling 550.4 nm up until the 0940 UTC sched, comparing with the outright monohull 24 hour record of 596.6 miles set by the VO70 Ericsson 4 in 2008. Dongfeng Race Team is still attempting to reach the Chilean port of Ushuaia to repair the top of their mast. Meanwhile, Team SCA continues to battle its way through heinous conditions in the Southern Ocean, some 550nm behind the pack still racing. Sam Davies' crew has been considerably hampered by damage to their fractional code zero after a Chinese gybe last week sent the boat crashing on its side. Team SCA is expected to round Cape Horn in the early hours (GMT) on Wednesday. “We can’t take any more risk with the sails that are left because we need them on the way from Cape Horn to Itajaí,” said Davies.